Wheat that flowered May10 or earlier has mostly escaped Fusarium head blight (A.K.A head scab). Infections take about 21 days to be fully expressed following infection, so it is still a tad early to know the fate of later flowering wheat fields. I am optimistic, however, that this will not be a big head scab year. On another front, I am seeing a considerable amount of stripe rust in fields that have not been treated with a fungicide. Neighboring states are seeing the same. 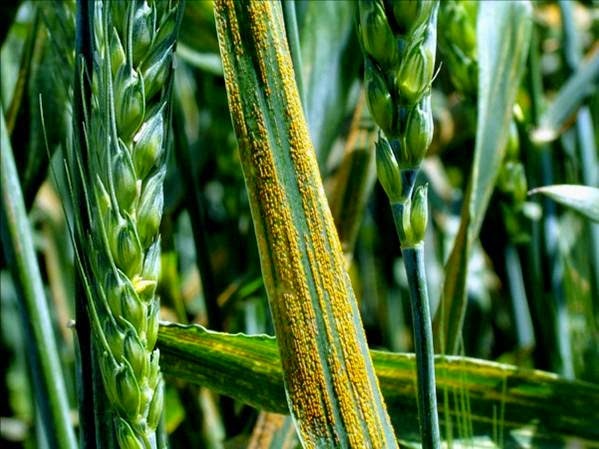 Symptoms are very striking and are evident as long, thin lesions filled with masses of very bright yellow-orange spores (see photo). 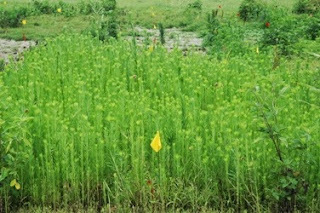 Modern fungicides like Caramba, Headline, Prosaro and the like are highly effective against all rust diseases. As a result, I would not anticipate seeing significant damage from stripe rust in fields treated for head scab (at early flowering, for example). In any event, you might want to go out to your fields at this time and take a peek. 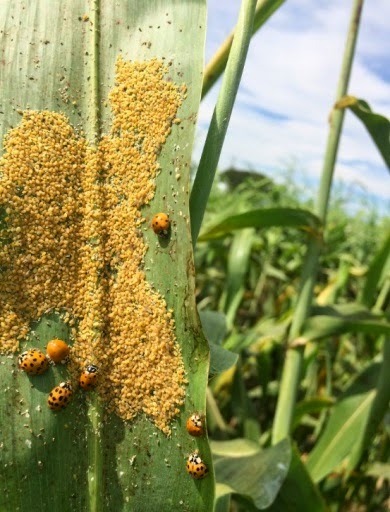 Over the past two growing seasons a difficult new insect pest of grain sorghum has been found across the mid-south. This new pest is an aphid called the sugarcane aphid, Melanaphis sacchari. 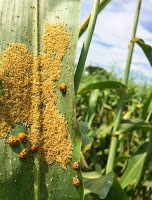 Be sure not to confuse this with the yellow sugarcane aphid, Sipha flava, which has been around the lower Mississippi river valley for several years. These are two completely different insects. Before we go any further, it is important that you understand that at present, NEITHER of these aphids have been found in Kentucky. My concern is one of preparation, as both of these aphids are found in western Tennessee and southeastern Missouri. The UK Extension Weed Science Group is conducting a Weed Science Training from 9 am – 3 pm. 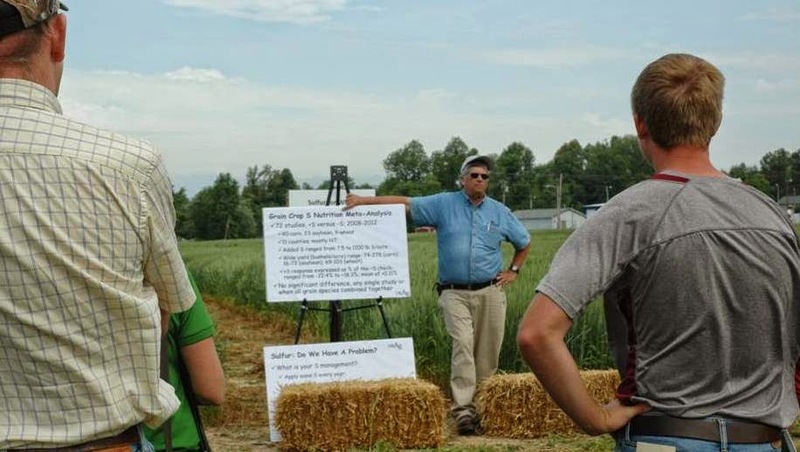 Two locations will be offered - June 23, 2015 at the UK Research and Education Center (Princeton, KY) and June 25, 2015 at the UK Spindletop Farm (Lexington, KY). Please RSVP your location with a lunch count. This program is being offered to UK Agriculture and Natural Resource Agents, other UK Agronomists, pesticide applicators, crop consultants, crop producers and agribusiness personnel. CCA & Commercial Pesticide Applicator Credits have been applied for. The potential for farmers to lock-in corn profits with a cash-forward contract has been limited since March. The cash corn price for October delivery has been working steadily lower since the March 31st Prospective Plantings report (Table 1). The average corn price is $0.30/bushel lower from the March 27 price and about $0.16 lower from last month (April 18). Unlike soybeans, cash corn bids were not rocked by the May WASDE and have increased $0.07/bushel above the May 12th cash bid price (Table 1). the FHB Alerts at http://scabusa.org/fhb_alert.php.